The refugees from Allianz Arena are again presenting their idea of a new stadium. And again it meets opposition in the city. Should TSV 1860 build just beside the Olympic Stadium? A few days ago during the annual general assembly of TSV 1860 these words were greeted with huge applause: “We need to leave the arena!”. Intentions of The Lions have been clear for a few years now as the team hopes to escape from Allianz Arena as soon as possible. 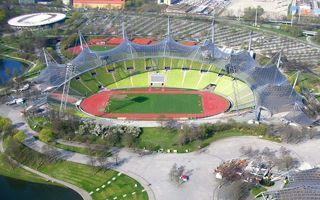 The city already agreed to relocation back into city centre’s Grűnwalder Stadion. However this solution may clearly be only a temporary move as there’s not enough room to upgrade the stadium enough in the long run. Too small, too old, too little for TSV’s aspirations. Long-term goal has for years been building a private stadium just for the club. 1860 have proposed several visions over the past years, but none came to fruition so far. Now a new scheme is revealed: building next to the Olympic Stadium, within Olympiapark borders. A plot ranked by TSV as suitable will be free in upcoming years as the dated hockey arena awaits demolition. The site cleared will lie in the east of Olympiapark, just across the street from the famous car exhibition BMW World. However, as stadiums are much larger than indoor halls, there’s very limited room for construction. TSV 1860 are sure a stadium of 30,000-35,000 might fit there if its stands are steep enough. The fans should love such a cosy and atmospheric stadium, especially with its planned 8,000-10,000-large terraces for most vocal supporters. This scheme is a bold one, but also one that instantly raises questions. One that people from outside Munich might ask is why build a new stadium beside one that is left without football use already? However the Olympic Stadium is far too big to balance cost and revenues. It’s also listed as a monument and cannot be altered in a way that would satisfy current football needs. More serious issues arise as deputy mayor for sports Christine Strobl carefully and diplomatically claims there are many question marks about this plan. More straightforward answer is simply that the city would prefer “The Sixties” to stick to the current stadium vision, which would see it built in eastern Munich. Also the Olympic Park dismisses such plans. Arno Hartung managing the complex claims he “cannot see that happen despite best intentions”. According to him the club is more than welcome to settle for good within the Olympiapark, but not with the proposed scheme.